Old fashioned and newfangled candy from a tiny New York kitchen. The bloggers over at Evil Mad Scientist Laboratories usually make fantastic homemade gadgets. This week for Valentine's Day they went nuts and experimented with candy instead. First they teach readers how to get their own messages onto candy hearts (hint: get the current text off with a Microplane). 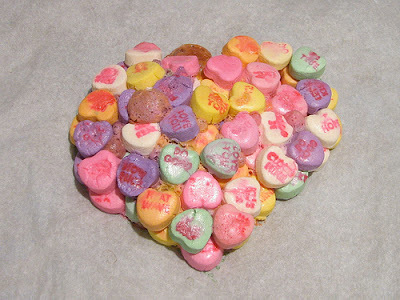 Next they made an enormous melted candy heart out of smaller hearts (see above). I'm not going to try this at home, but if you've ever wondered what will happen if you wet conversation hearts and put them in the oven at 300°, now's your chance to find out.